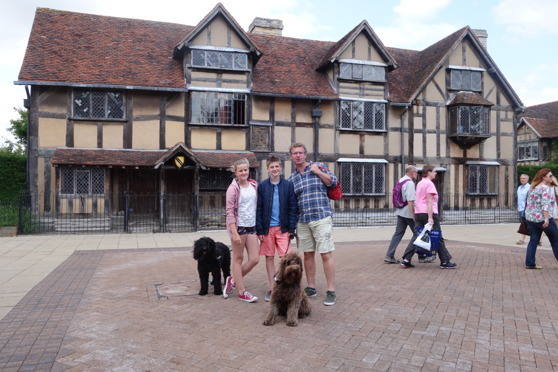 Here we are at Stratford-upon-Avon, Shakespear's home town, posing by the house where he was born. Such a sweet little town, but packed with tourists - like us! The comment has been sent. It will be published after having been reviewed. Happy Easter to you all! The Miracles already 3 years old - hurray! Yatzie 11 today and strong as ever! 4 years today - hurray for the Angels! Merry Christmas to all our friends! Hurray for the Miracles - 2 years old! An unforgettable night in the reindeer collar at Tjokkola, Stekenjokk mountains in Swedish Lapland. Vacation begins! Off to Sweden! Yatzie turns 10 years old! Hurray for the Angels - 3 years old today! A very special guest from Poland! Hurray for the Miracles 1 year old! Lapland also has a sunny beach! Yatzie and Moët are getting famous! Please papa, one more piece of lobster? Sleeping in in mama's bed! No it is not snow! Vera at her first show - promising puppy! We are taking a tracking course! A house full of barbets! Happy 2-year birthday to the Angels! The warmest Jan 25 ever! Nothing is like a Swedish Julbord! Merry Christmas to all of our friends! Osher's new daddy is here! Amaro - see you soon again! A popular place - the kitchen! I also like puppy food mama! Neat eaters - no mess! Pick me up first mummy! Yihoo - free to run again! Living room destruction is begun! Let's take a walk mum! All puppies doubled their weight! Caring cooperation - amazing and sweet! Hurray - the Champagne litter turns 4! Moët's profile on day 58! Only one week to go! A new pro puppy scale! You can feel the puppies! Wow, plenty of milk already! Big, beautiful thistles - but not in Moët's fur please! Open this gate please mum! Moët knows how to relax! Hurray – it is vacation! A birthday kiss for Margot! Moët and Cooper the labrador puppy! Life is good - according to Moët! Life is good - according to Yatzie! Hurray - Yatzie turns 8 today! Hurray for The Angels - 1 year today! At the hair dresser - mine! Hello! I am looking for a mum & dad :-) ! Hurray - many gifts under the tree! Merry Christmas from Yatzie and Moët! Jolie (Zofiel) a very happy dog! The Barbet book is here! Moët blessing the barbet book! 3 year old Bubbles! Happy birthday! Hurray for Luna - the student! Yeyezel and Yatzie - best playmates! Cherubiel - the prince angel! 4 + 10 = paradise! And then travelling the world! Mama is here - but where? Mama, how many siblings are there? Nikki is moving to Holland - playful times! Yes - Yatzie is pregnant! Can I come in now please? And then the birthday gift! Do not play with the alp cows! Great news - the grass is out! How much will a labrador eat in heaven? Oh my... what happened to Moët? Who holds the most valuable treasure? On the boat to Sweden! "Moët, ska vi gå ut?" Yihoo - retrieving on the beach again! And today the BIG reward! Moët Best of Breed and Youth Champion. Yatzie got the res CAC! Spring feelings and a sweet kiss! Moët got the Reserve CAC again! Holidays - times for cuddles and gifts! Those scary black faced boys - but hurray, they bring sweets! At the Dutch Barbet Club exhibition! No, no, not water dogs - mud dogs! Moët groomed - by me! We will miss you Joey! A lot of dogs in the kitchen! One can watch them play forever! Happy Easter greeting from Yatzie and Moët! First time retrieving on the beach! Sunshine, waters, birds and Barbets - the perfect combination! Bravo Moёt & Chandon! Bravo Saartje! "Tjihoo - I am off to Poland!" Watch out - puppies on the road! Watch out - puppies in the fridge! First swim - in the bathtub! Suckeling - mamas milk is still the best! Video: Morning joy in the garden.. Videos. Almost walking at 12 days. Video. Yatzie and her 9 days old puppies. Number 10 - at the after party! Lovin' it - terrain hunting! Lovin' it - water retrieving! Silas - the smiling dog! Sorry Ruff, my heart belongs to Django! Yatzie is so ready - but Django?